President Donald Trump has accidentally revealed typically secret details of a covert special operations unit after he posted a video on Twitter showing him talking and taking selfies with what appeared to be members of a US Navy SEALs team during his unannounced trip to Baghdad, Newsweek reports. "Even during special operation demonstrations for congressional delegations or for the president or vice president, personnel either have their faces covered or their face is digitally blurred prior to a release to the general public," the official noted. He admitted that he does not recall "another time where special operation forces had to pose with their faces visible while serving in a war zone." His comments came after aviation enthusiasts managed to track Air Force One on its secret flight to Iraq, posting pictures of the distinctive blue and white Boeing jet flying over England on their Twitter accounts. — CivMilAir ✈🎅🎄🐈 (@CivMilAir) 26 декабря 2018 г. — Nick (@ETEJSpotter) 26 декабря 2018 г.
WikiLeaks, in turn, posted a map of the route the jet was taking, tweeting, in particular, that the plane's transponders were either changed or disabled near Romania. — WikiLeaks (@wikileaks) 26 декабря 2018 г. Earlier, NBC News quoted Trump as saying that when he was en route to Baghdad, he had concerns for "the institution of the presidency" and the first lady. "But if you would have seen what we had to go through, with the darkened plane with all windows closed, with no lights on whatsoever, anywhere, pitch black, I’ve never seen that, been on many airplanes, all types and shapes and sizes, I’ve never seen anything like it," Trump noted. 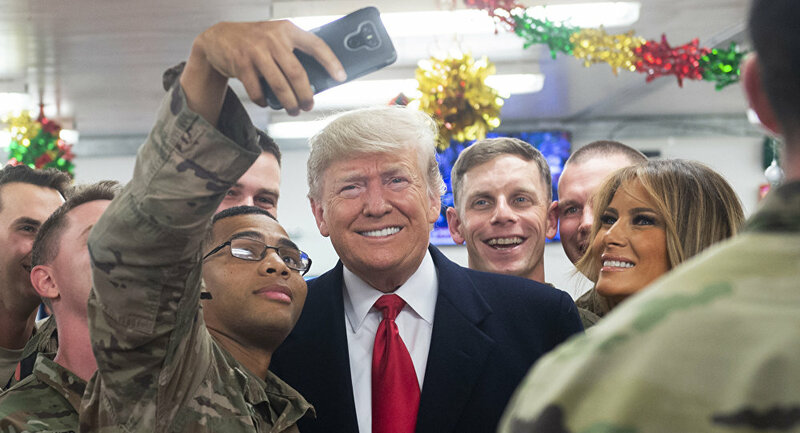 On December 26, he and First Lady Melania Trump made a surprise visit to Iraq to meet US servicemen stationed at the Ayn al-Asad Air Base, where he told reporters that he has "no plans at all" to withdraw US troops from Iraq. The visit marked the first time Trump visited a war zone since becoming president. *Daesh (also known as ISIS/ISIL/Islamic State) is a terrorist group banned in Russia and a number of other countries.